A pacy, topic-based course with comprehensive coverage of language and skills for business, it motivates and engages both professionals and students preparing for working life. 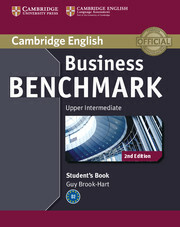 The Business Vantage Student's Book contains authentic listening and reading materials, including interviews with business people, providing models for up‐to‐date business language. Grammar and vocabulary exercises train students to avoid common mistakes, identified using Cambridge's unique collection of real exam candidates' answers. 'Grammar workshops' practise grammar in relevant business contexts. A BULATS version of this Student's Book is also available.